Little, Carl. "Painting the Bar to Rodick's Island: A New Version of a Classic Acadia Image Comes to Light," Friends of Acadia Journal, vol. 23, no. 2 (Summer 2018), p. 16, collor illus. Eastberg, John C. and Eric Vogel. Layton’s Legacy: A Historic American Art Collection 1888–2013. Milwaukee, Wisconsin: Layton Art Collection, Inc., 2013, p. 458, color illus. p. 459. Hill, Ruth Ann. Discovering Old Bar Harbor and Acadia National Park: An Unconventional History and Guide. Maine: Down East Books, 1996, b/w illus. p. 91. Wilmerding, John. 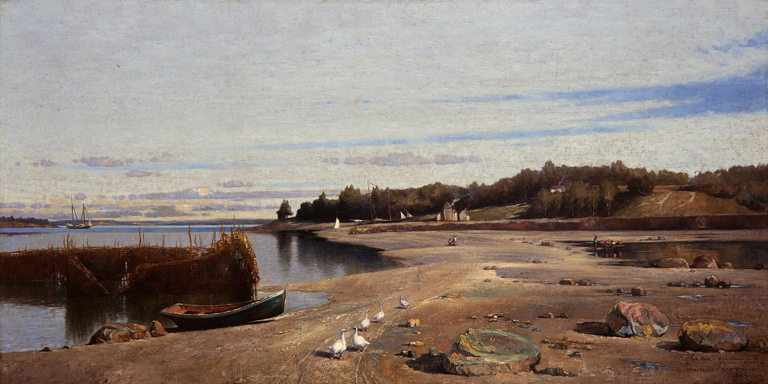 The Artist’s Mount Desert: American Painters on the Maine Coast. Princeton: Princeton University Press, 1994, pp. 136 and 139, b/w illus. p. 138. Cullity, Brian. Romancing the Shore: Views of Coastal New England. Sandwich, Massachusetts: Heritage Plantation of Sandwich, 1990, p. 6, illus. 1. Layton Art Gallery. Catalogue of the Layton Art Gallery. Milwaukee, Wisconsin: Layton Art Gallery, 1921, p. 77, cat. 222. Romancing the Shore: Views of Coastal New England, Heritage Plantation of Sandwich, Massachusetts, May 13–October 14, 1990.